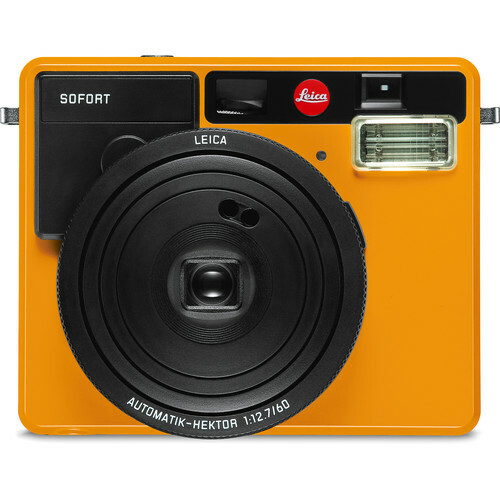 Box Dimensions (LxWxH) 8.75 x 4.35 x 3.6"
Sofort Instant Film Camera (Orange) is rated 4.1 out of 5 by 14. Rated 4 out of 5 by Louison from It's a Leica. Nuff Said. The red dot wins. First and foremost, people that buy Leica will not care about the price tag. So if you are one of this people, you will get excited over this one. It's a niche market for this German brand. Like a Montblanc for your ballpoint pens. Bought mine in this shop last week and so far I am having a blast with it. Buttons are intuitive and idiot proof. Battery life is good (100 shots on a single charge) It accepts a Fuji Instax film which is a plus so that you may have a more affordable alternative. It is very eye catching. Yes it looks like a toy, but it is a well built toy if I may add. Solid build even if it is plastic all over. Go ahead and buy your dream Leica camera. I know you want to. Rated 5 out of 5 by Nonnac from Fun Camera A great camera to have while on trips. Pictures will be left behind as a gifts for those who allowed me to photograph them. Attach a sticker on the back with your info as to how they can contact you. Rated 2 out of 5 by Anonymous from Sofort - a rebranded Fuji Neo 90 Had a chance to use a friends Sofort against my Fuji Neo 90 and fired of some shots of Sofort with Leica Monochrome film and Neo 90 with Instax Monochrome film Photographs 1. The pictures were pretty identical so not attaching any 2. There was no difference in the border of the films - one web review said the picture border was a cream colour on Leica film (maybe thats on colour film or doesn't exist) 3. The black cassette holding the film had Instax on it 4. Back of the picture did say Leica So no difference in picture quality Camera difference 1. The Leica looks very cool - had the black and white model 2. The Neo 90 looks very cool 3. Leica harder to hold and easy to touch the buttons on the back 4. Neo 90 is grippy and great to hold 5. Power switch of Leica can accidentally be turned on 6. Neo 90 has really good flip action power button - hard to accidentally push on Summary - unless you really must buy a Leica instead buy TWO Fuji Neo 90's for same cost and carry a 2 camera's, one with Colour film and one with Monochrome ready loaded The Fuji film is great - shame Leica didn't bother to at least have variable aperture. Rated 4 out of 5 by Anonymous from A Fun Addition I love the simple design, easy to use controls and throw-back like instant prints. Everyone who sees the camera, and sees prints come shooting out of the side of the camera, think this is pretty cool. I've only shot black and white film so far, and the final results have been mixed. The standard camera automatic function seems to overexpose the prints a bit, but there is a compensation button that seems to be the key to making the finished prints look good. I just have to remember to engage it as each time you turn the camera off, it resets to the the standard settings. The instructions were somewhat non-Leica-like, with numerous sheets in a variety of languages making it a bit confusing to figure it all out. Luckily, everything is pretty straightforward so if you've used a camera before, you shouldn't have any trouble. I'm looking forward to bringing this to some larger family gatherings to really put the camera through its paces. It's a novelty, to be sure, but it's fun to be able to watch the print develop right before your eyes. I love it. Rated 5 out of 5 by Anonymous from Gorgeous and Fun Instant Camera Full of Tech Options Have had two of these and the Fuji Mini 90. Bought the Fuji as a gift and to see if I liked the instant pix. I did as did everyone I encountered. Just was surprised at its size. Picked up the Sofort and the fun continued. Took about 30 pix with the Fuji and over 50 with the Sofort. The cameras are obviously similar in size but with different designs and the Sofort is very tech heavy vs the Mini 90. You can read up on the two for more accurate tech details. With more options you need to pay more attention to your settings. The controls are completely intuitive and easy to understand and manipulate. One I haven't figured out is the setting needed for when you have a mix of light skinned and dark skinned people indoors. The features fade into the background. User error! Love the Sofort. Battery seems to last forever. People love the old school looking pictures... and most I give out seem to end up in wallets...like the old days. Don't know if there is a difference or a huge difference in the picture quality between the Fuji 90 and the Sofort. Wanted to compete head to head but didn't have the time. Both cameras are about fun...and deliver it with their own style. If the Sofort is worth twice the price is relative to each person. It does seem to have twice the tech and the Leica simplicity. I'm very happy with the Sofort. Rated 5 out of 5 by Ken from First day impressions Some have compared this camera to Fuji's top-of-the-line model but there are some differences I found in my research & hands on experience. First, this is a much better looking camera. The retro Fuji with the very plastic looking body really looks cheap. While the Leica is plastic, it looks and feels more substantial. My old SX-70 was also plastic (except for the lens) so this is a minor point. I would have preferred a brushed aluminum face in the mint color, however. The tripod mount is on the bottom whereas the Fuji is on the side. I wish this had both positions, but most tripods and do a 90-degree angle. The macro function leaves the flash on -- a software mistake in my view. Anything within the 1-2' range will be blown out. The software does better with long distances, canceling the flash which would never make it beyond 6'. The mechanism is very quiet and sounds sturdy. The pictures look very good in daylight and normal flash range. I'm not a big fan of the Instax Mini size, but that keeps the print cost to under $1. Be aware the LCD displays distance in meters. A bundled wrist strap would have made more sense than a neck strap. At this price point it should have had a glass lens. Of the available options for fun instant photos, this is one of the best. More serious photographers should look to getting an older Polaroid camera. Rated 5 out of 5 by Dorothy from It's just fun but take a little getting used to! I find I put it on the darker setting more often than not otherwise daylight scenes look overexposed and the color is washed out. I've only shot one pack of color and haven't finished the BW pack yet. I prefer BW. I have some plans for these little pictures so maybe I'm not using it like a lot of people would. I'll be scanning and post-processing them. That said, it's joined my camera collection; a couple digital and a couple older film cameras, and now this. Rated 4 out of 5 by Anonymous from Fun It's not Polaroid, but it's pretty cool. Definitely similar to the Fuji instax cameras, but feels way better when you're using it. If you wanna have some fun & you've got the extra cash to upgrade from Fuji, this lil guy is worth it. Does it accept Fuji instax mini Film? The Leica Sofort Instant Film Camera supports both Leica Sorfort and Fujifilm instax mini-format film. Is the bulb mode on here infinite or max 10 seconds like on the instax 90? Also do you have to press and hold the button for bulb mode like the 90, or can you press to open the shutter and then press to close it? Fortunately, we have the item in the store to test. When trying out Bulb mode, it only stayed open for 10 seconds while holding it down. So the Bulb mode is exactly like on the Instax 90. Does this come with instant film pack or anything else? What is the approximate outdate time for a pack of film? Thank you. Answered by: Harald G M.
Is this camera also digital? If so, what type of memory card does it take? No, this camera is for shooting film only. Is it possible to remove the lens and replace it with another lens using an adapter? Does it come with a strap, or do you have to order that extra? It comes with a strap, but I also purchased a fun colorful one from BH by Leica. What is the minimum focus distance? Does it change when using Macro mode?